Regardless of the country you live in, there will always be people working the age-old nine to five-er. However, for some, the daily grind isn’t just a waste of forty hours a week. It’s where they can go to be inspired, creative and productive. It doesn’t matter what language you speak, or what country you live in because office design is a universal concept. 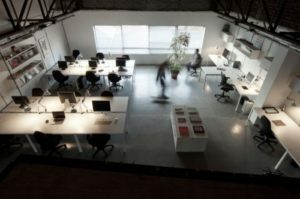 We all have the same idea of what a well-designed office should look like. Here are seven offices from around the world – one from each continent to be exact. This is a beautifully designed space for a company that focuses exclusively on the development, research and manufacture of skin and beauty products. Union Swiss is a privately owned skin care company in South Africa, and their office is nothing short of amazing. It is a very well-lit, spacious office with smooth, clean lines and bright happy colours throughout. The design of the Taranta Creations office space is a reflection of the ongoing creative process within the office space. It looks like something out of a sci-fi movie. The staircase that connects the first to the second floor has a spaceship look and feel to it. Although, it was designed to be reminiscent of a water drop. The top floor is unique in that its floor is one continuous desk that has four sitting areas are cut out. So, instead of having a sunken living room they have sunken cubicles. 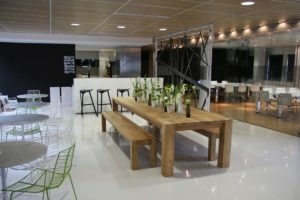 The designers use the work floor for walking, sketching, modelling, thinking, drafting, meeting, sitting and relaxing. The informal space encourages cross-pollination between the different projects and disciplines. Not to mention the fact that it just looks plain cool. Am I on the set of the latest Disney movie or am I at work? If you work for XSolve, I could image that being a question you would regularly ask yourself and your colleagues. Thanks to some imaginative and talented designers, the XSolve Software House in Poland has a bit of a fairy-tale vibe to it. The exposed wood beams with brick walls, polished stone floors and dim lighting blur the line between work office and whimsical cottage in the woods. They even have hammocks! I’m all for naps at work! 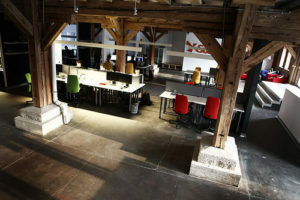 Brick walls and hardwoods floors are becoming quite the trend in the latest office design, and for good reason too! It’s beautiful, professional yet still and offers a comfortable relaxed environment. alsoKNOWNas has all of this and an industrial look which makes the space even more visually pleasing. AKA describes their office as, a meeting place, a place to share ideas, a place to get feedback and grow your creative perspective, a place to relax with like-minded people and ultimately a place that people wanted to come to work every day to do amazing work. Aged-wood ceilings, exposed metal beams, and concrete floors give the SMOG office character. Smog is made up of Pablo González, Moisés Arancibia and a team of multidisciplinary super talented people that specialise in design, animation and production. 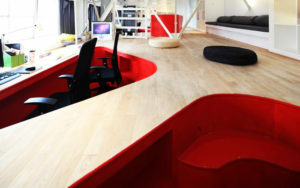 This office fit out is as unique as the people that make up the company. 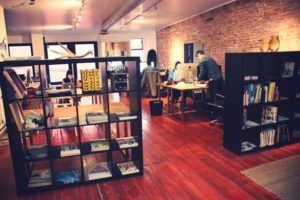 Their office is big and open, which allows for comfortable working space. The main focal point in the office is the conference room. It’s a glass-enclosed cube that has a striking resemblance to a shipping container that one might see on a cargo-boat. Regardless, it is an interesting structure that completes the space. This building is HUGE. The ANZ Bank of Australia Center is actually the largest single-tenanted building in the country. It reminds me of something out of the Matrix. With so many different levels, floors, and places to hide I can’t imagine how any work gets done it here. The building stands an impressive 13 levels, all configured to maximise natural lighting and promote workplace integration and communication. I think I’d purposefully get lost, just so I could wander around the various spectacular sitting areas throughout the building. Whoever said Antarctica was only inhabited by penguins lied. People work there too! During Antarctica’s summer months it is alive and well with researchers from all over the globe that inhabit these various self-sustaining research bases. These little research bases look like spaceships straight out of Star Trek. Sci-fi and Disney movies are where designers get their inspiration from, I guess The bases use the latest and greatest technology in order to sustain life in Antarctica’s harsh conditions.